Generally speaking, the player who must speak first is in a bad position in Poker, the player who is late to speak has a superior position. 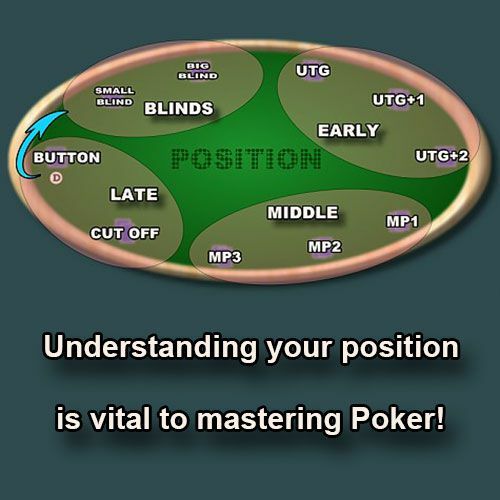 This applies in all forms of the game including texas holdem and omaha. But you cannot get a lot of action if you confine your close decisions to hands in which you have good position. You must act on the customs of the players in the game. Suppose the player at your right is first to speak and opens, or bets. If you think the pot will eventually offer you good odds, you should stay in in anticipation of that In a conservative game, of course, you would not play any doubtful hand without waiting to see; but then, in a conservative game, you should not play a doubtful hand anyway. In the final round of betting, position is almost everything. The best possible position in poker is when you are last in turn to bet, and there is only one of the other hands you are afraid of. Your turn will come after his and you will already know what he has done. The worst possible position is between two hands that you are afraid of. If the hand before you bets, you are afraid to call even if you think you may have him beaten. The other dangerous hand comes after you and may raise. You should always try to anticipate what your position will be on the final round of betting. Occasionally you can create a good position from a situation in which your position is naturally a bad one.